Collects Army of Darkness Vol. 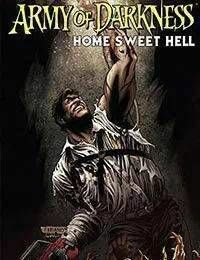 2 #9-12!The adventures of Ashley J. Williams continue in the Army of Darkness: Home Sweet Hell from writers James Kuhoric and Mike Raicht, along with artist Fernando Blanco! Now that the Long Road Back Home has been taken, its time to head back to Home Sweet Hell! Ash is back in a world mostly of his own making - back in the S-Mart and checking prices on toasters and girdles. Only thing is, the demons are conspiring and Ash is, well - Ash doesnt remember anything! And because he doesnt remember anything, heading out to that cabin in the woods after a long work week sounds just fine to him... welcome to hell ash - again!